Artist's representation of a tidal disruption event (a star being torn apart by a black hole). Credit: NASA / CXC / M. Weiss. It's been hypothesized that there is a supermassive black hole at the center of almost every large galaxy, residing in the regions that are most densely populated by stars. It's only natural to think that eventually one of these stars will interact with the black hole. What happens then? Artist’s impression of the orbit of a star passing very close to the supermassive black hole at the center of the Milky Way. Credit: ESO. We know that at its center, the Milky Way has a supermassive black hole. We have never observed the black hole directly, but we can infer its presence by the stars orbiting around it at incredible speeds of up to 5000 kilometers per second around a single point! Eventually one of these stars will come in close contact with the black hole and will either get torn apart and produce a bright flash of light, or get swallowed in an instant. 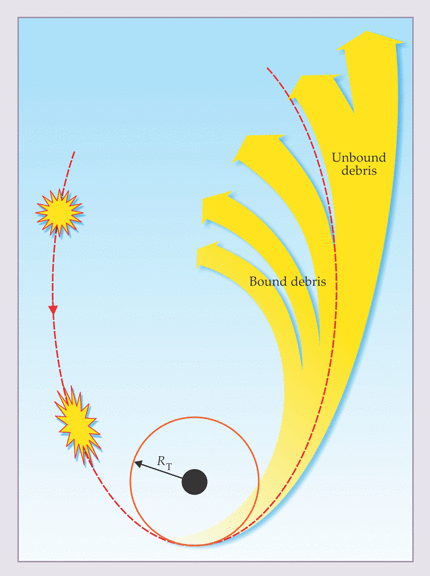 Diagram showing the tidal disruption of a star that comes within the tidal disruption radius of a black hole. Credit: S. Gezari, Physics Today. The black hole at the center of the Milky Way is about 4 million times more massive than the Sun, yet it is only 30 times wider than the Sun. The black hole's "size" is defined as the Schwarzschild radius or the radius at which nothing can escape the black hole. The mass of a black hole also determines its "tidal disruption radius", or the radius at which the black hole is likely to disrupt a star. The tidal disruption radius scales to the 1/3 power with the mass of the black hole, meaning that a black hole that is 8 times more massive will have a tidal disruption radius that's only 2 times more massive. Yet the Schwarzschild radius scales linearly, so the same black hole will have a Schwarzschild radius 8 times larger. One can see that for increasingly more massive black holes, the Schwarzschild radius will eventually catch up to the tidal disruption radius, and any star that dares to come close enough to the black hole will just be swallowed, never to be seen again. However, it's possible for the star to interact with the black hole without being entirely swallowed. This is where tidal disruption events come in. By now you've probably realized that a star being tidally disrupted by a black hole is actually a rare event. To date, scientists have observed about 60 TDEs. For context, astronomers have observed hundreds of supernovae in the last year alone! From numerical simulations, we know that about half of the star's mass is unbounded during a TDE, while the other half forms an accretion disk. The accretion disk produces thermal emission that is observed as a bright transient that can last from weeks to a few months before fading. By observing this transient light and comparing it to theoretical models, we can study the properties of the system. Bolometric light curve of PS16dtm compared to models of TDEs, suggesting that the flare will remain bright for years (Blanchard et al. 2017).